Teaching children to pray is so important yet can be a challenge. 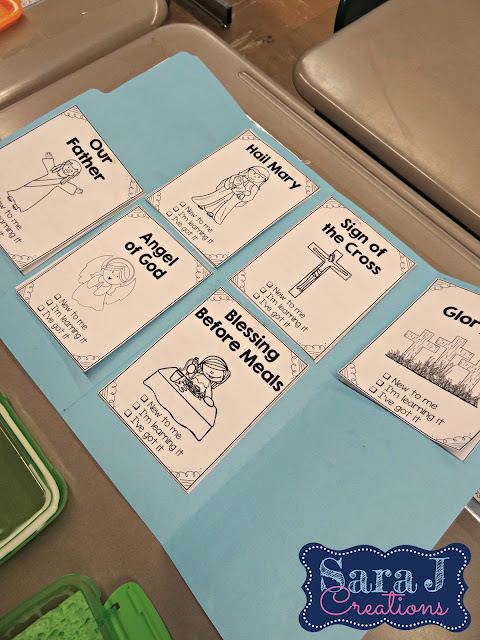 With our first graders in our religious education after school program, we try to expose them to many different kinds of prayer so that they see that there is no right or wrong way to pray. 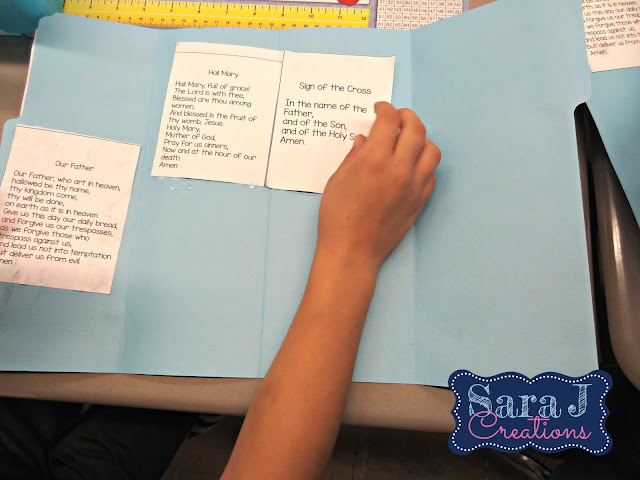 Part of our Catholic faith is learning traditional memorized prayers. Some of these are recited in Mass each week, others are used at different times throughout the year. These are important to our faith, yet most of our first graders come in without knowing them. We work hard all year to get our students to memorize these prayers. In first grade, we focus on Our Father, Hail Mary, Sign of the Cross, Glory Be, Prayer Before Meals and Angel of God. We practice these in class, but we also expect the parents to practice these at home with their children. In years past, we worked on one prayer at a time. 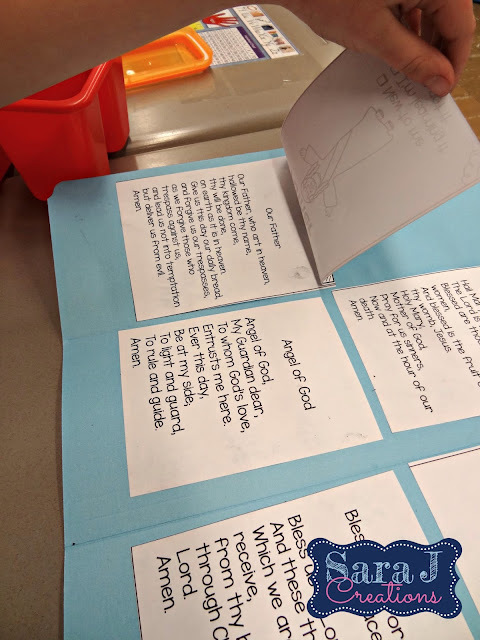 We would type up the words to the prayer and attach it to a foam shape (in hopes of it not getting lost in their folders and backpacks) and send it home. When a student had the prayer memorized, he/she would come to us at the beginning of class and recite it. If they got it right, they picked a prize out of the prize box. Once the majority of the class had the prayer memorized, we handed out the next one. This seemed to work okay. Some students memorized them all, other students memorized very few. I knew this year I wanted to try something new. I hated penalizing the students who were eager to memorize more and make them wait for their classmates to catch up. This year, I created a lapbook instead. In it would be all of the prayers they would need to memorize for the year. They could work at their own pace, focusing on the prayer of their choosing. 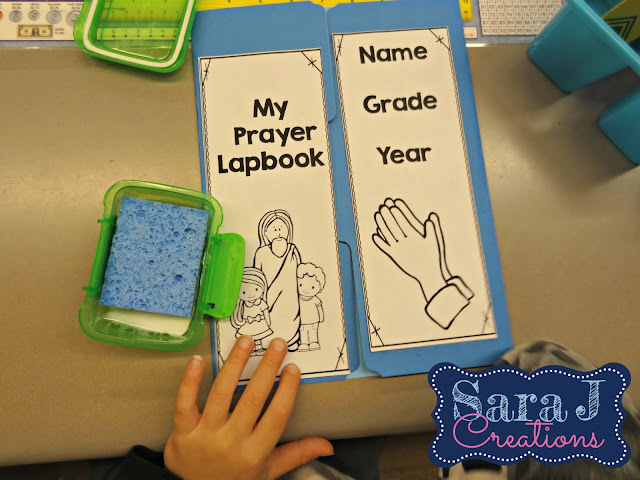 We wouldn't have to send home each individual prayer and they would have a helpful tool at home to help them practice. Assembling them was pretty easy. Since we are limited on time (I only have them for an hour and a half each week) and it was the beginning of the year, I pre cut all the pieces so that they just had to glue them. This was our first year with glue sponges and they are awesome!! No more sharing glue or having huge globs of glue on our papers. I bought colored file folders and refolded them so the two sides met in the middle. The students glued the cover on first. Then we glued the prayers down to make sure we had the spacing right. There was plenty of space for six prayers to fit. Next, we added covers to each prayer. This made it more interactive and gave them a flap where they could practice covering the prayer while they were memorizing it. Once they had everything glued on, they were allowed to go back and color and fill out the cover and then practice the prayers. 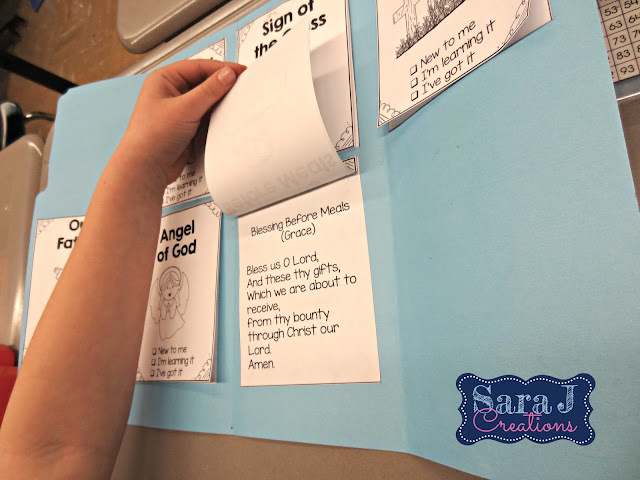 This is definitely a project that requires some support at home (or more time in the classroom) to help students read the words of the prayer and then practice it enough to memorize it. I am so glad we switched to lapbooks and letting the students work at their own pace. As of December, we had two students who had already memorized all of their prayers!! Normally, we don't see that until the spring. 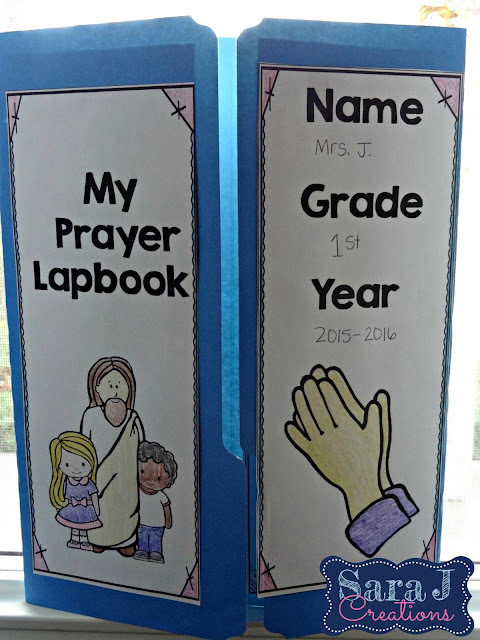 I don't know if it is the new lapbooks, the fact that we ditched the treasure box for reward tags, or just the make up of this class, but they are on fire this year and are LOVING memorizing and reciting their prayers. We've even had to add The Nicene Creed, The Apostle's Creed and The Act of Contrition as a challenge for those students who want to learn more prayers. It is so nice to see young children embracing the faith and learning new ways to pray. If you are interested in implementing this Catholic Prayers Lapbook, you can find if HERE in my store. As you can see, there are a lot more prayers. 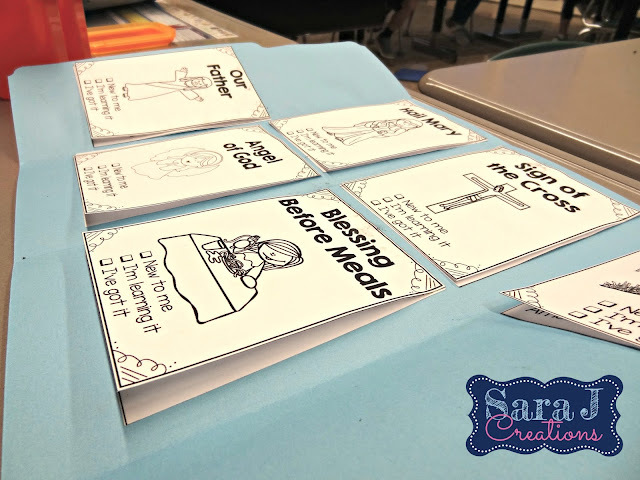 If you plan to include them all, you will have to adjust the spacing of them in the lapbook and maybe even print them smaller since this was originally designed to hold 6 prayers. I also added an editable page where you can open the file in Adobe Acrobat and type other prayers that are not included in this file. I'm excited to share that as of January 2019, I now have this Catholic Prayers Lapbook in Spanish. An awesome customer and Spanish/English teacher helped me to translate the prayers I already had into Spanish. Need that English and the Spanish version? I've thought of that already for you! I bundled the two lapbooks together and discounted the price 20%. Buy the bundle and save money vs buying each lapbook individually. 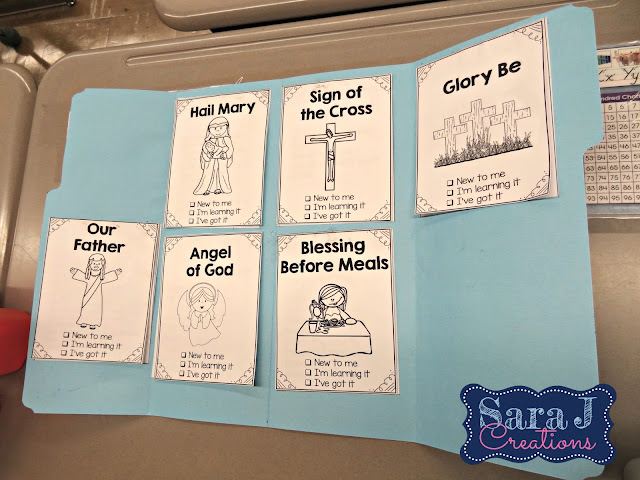 Looking for other ideas to use in a Catholic classroom? 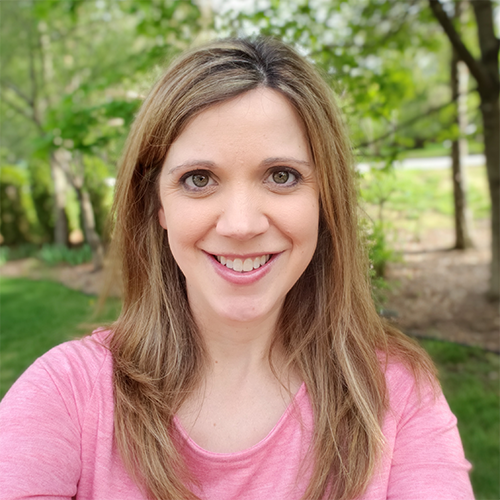 Check out my Pinterest board for great ideas! Great idea just wish you would have included templates. The templates are available in my TpT store. Clicking on any of the pictures will take you to the right place. Thanks for your comment. Hi! How are you able to mark "New to Me", "I'm Learning It" or "I've Got It" if these go home? Or are these kept at school? Hope you reply, because I love this idea! The students mark these as their own way to self assess when they are at home practicing. This helps them to know what they need to still work on, which prayers they are ready to recite for us and what ones they've already mastered. How did you fit all of the prayers? Did you glue some on the back? Love the template and am currently using it in my RE class! My students are also enjoying! We only require them to learn 6 prayers which fits in there nicely and was how the product started. I kept getting requests to add other prayers. If you want to include them all you'd definitely have to change the spacing, squeeze them together and perhaps even put some on the back.